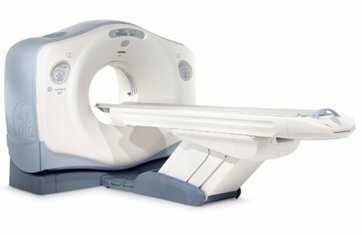 How much does CT Scan Cost in Bangalore? The Cost of CT scans in Bangalore varies for each centre. Some are quite expensive and few are cheaper than you think. Usually CT scans in Bangalore costs around Rs. 2,500 to Rs. 7,000 and some scan centres charge up to Rs. 20,000 for 3D CT as per diagnostic requirements. The scan cost differs based on the kind of scans. Abdominal CT Scans are quite expensive than other CT scans because it includes 2-3 studies. 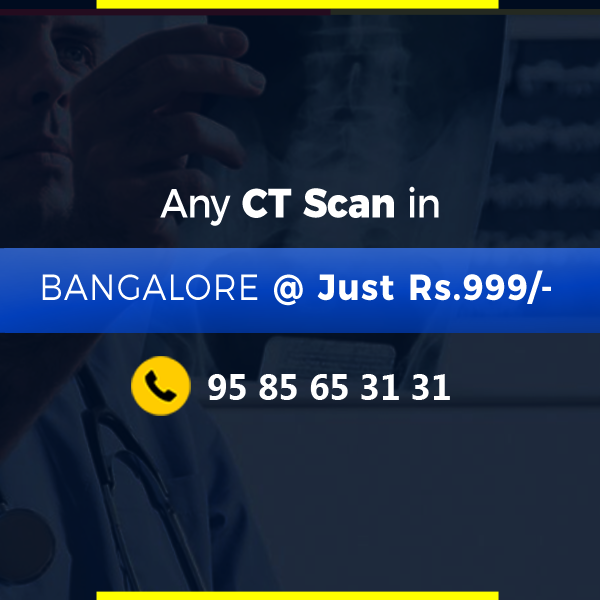 Also, there is a huge price variation for abdomen scan in every CT scan centres in bangalore. You have to be prepared well while comparing scan prices as well the quality of the scan centres in Bangalore. There are lot of online scan booking portals that might give you better clarity on choosing the CT scan centers in bangalore. CT Scans also known as CAT Scans (Computed tomography / Computerized axial tomography) are helpful in capturing a series of X-Ray images in various angles to produce cross-sectional 3d images/virtual slices of the specific parts of our body. The First commercial CT scan was invented by Sir Godfrey Hounsfield, United Kingdom and it was installed in Atkinson Morley Hospital. 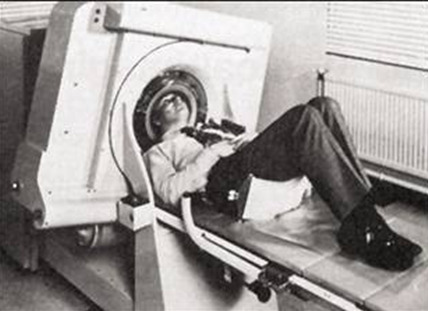 First CT Scan was done in the year 1971 which was announced publicly after testing by 1972. CT Scans can diagnose conditions such as severe injuries, broken bones, blood clots, pneumonia in the lungs, appendicitis, gallbladder disease, kidney stones, blocked bowel passage, cysts, tumours &cancers in various organs. It provides detailed cross-sectional views of all kinds of tissues in our body. The latest generation CT Scanners has advanced in getting clear & accurate imaging and lesser radiation on patients, whereas older CT Scanners emit high radiation which leads to several side effects in olden days. The CT scanners are typically a large box like machine with a hole/short tunnel in the center. The patients have to lie on the table which slides into the tunnel where the x-ray tube and detectors rotate around the patient & the scanner technologist operates & monitors your examination. Throughout the process, the patient is in a still position. Based on the requirement of the physician, visibility of internal structure has to be improved. In such cases, radio-contrast material (dye) like barium is injected into your body to highlight the blood vessels and diseases in organs. The Radiologist will check whether any allergies are there for patients towards medications or iodine and checks carefully on the history of the patient’s health. You will be checked whether you have diabetes, asthma, heart/kidney related problems& thyroid conditions. While going through this process, hours of fasting requirements would be advised by your radiologists accordingly. Once the x-ray beams create necessary images, a special computer program processes such large volume data to create 2D/3D images of your body which are then displayed on your monitor. Abdominal CT scan can accurately diagnose many causes of abdomen pains such as inflamed colon, colon cancer, diverticulitis, appendicitis. It is also helpful in imaging several types of tissues found in liver, spleen, pancreas & kidneys. CT Scans are one of the preferred methods for diagnosing different kind of cancers including colon cancer. 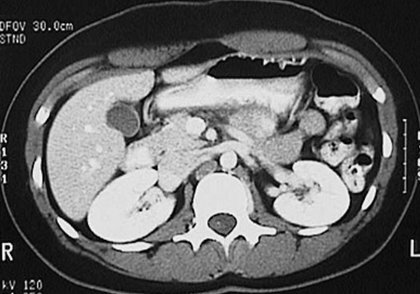 The physician can easily confirm the presence of tumours and can further analyze its size, location and for checking extension of such tumours with its neighbour tissues. Abdomen CT Scan also plays a major role in diagnosis of major vascular disorders which might lead to stroke, Gangrene (dead tissues caused by lack of blood flow) & kidney failure. For gastrointestinal tract examination through CT scans contrast material is usually provided to the patient for better visibility of certain tissues. Most of the CT Scans take 5 minutes to half an hour based on the diagnostic requirements. You will be waiting for a certain period in order to determine whether the images are clear enough to prepare reports. CTA – computed tomography angiography is used to analyse the blood flow in arteries flowing from the brain, lungs, kidneys, arms and till the end of the legs. CT Angiography scans are commonly used to treat pulmonary embolism, a condition where one or more arteries in lungs are getting blocked through blood clots. Blood flow analysis in renal arteries will be examined with CT angiography scans for the patients with hypertension & kidney related disorders. CTA is also used to treat Aneurysms (a weakened blood vessel) which might rupture at any time. CTA is widely used for treating other disorders such as dissection of aortas, malformation inside brain tissues, atherosclerotic disease. While using the contrast material you may feel some warmth sensation which is not a problem. But you should not feel any pain, if it pains, it means it is allergic to you. You have to inform the changes to radiologists before diagnosis with CT. You may be also asked to hold your breath for 10 to 25 seconds to make sure that images shouldn’t get blurred. After the scan, in order to flush out the contrast materials, you will be recommended to take plenty of fluids. CT chest scans are commonly used for diagnosing the cause of continuous cough, breath shortness, severe fever & chest pain. Special equipment of CT Chest scanning collects multiple images of organs and tissues of the chest. It is very helpful because it shows all kind of tissues in lungs, heart, bones, blood vessels & muscles at the same time. 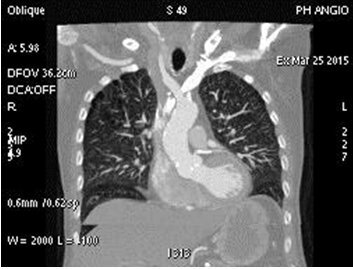 CT scan for chest is used to detect and evaluated the severity of lung tumours and also for assessing the possibility of such tumours spreading there from other parts of the body. CT chest scan can detect even small abnormalities that could be cancerous whereas conventional X-rays will not detect such cancerous cells at the beginning stage. CT chest scan has the ability to detect any kind of lung cancers. It can also detect other common lung disorders such as emphysema, tuberculosis & other interstitial lung diseases. Most of the patients who are met with accidents use CT chest scans to identify the damage to the organs and bones including spine and large blood vessels. Also, it can detect blood vessels which might be in a rupture stage, thereby CT scan helps preventing such severe conditions. CT chest scan with contrast, the contrast material is injected to the patients where they might feel some metallic taste with flush of heat. But, it just lasts for few minutes. The CT chest scan procedure from the preparation time usually takes not more than 15-30 minutes. CT Head scans helps in identifying brain tumours, head injuries & common brain diseases. It shows images of bones, soft tissues & blood vessels at the same time. Recent days the usage of head scans are increased due to the stress related brain disorders and road accidents that causes skull fractures and brain damages. It can detect blood clots or any kind of blood leak in the brain. For facial trauma related surgical reconstructions, ct head scans are widely used to determine the impact of damage in bone and soft tissues. Also it is commonly used to diagnose hearing related problems which happens due to the temporal bone diseases in skull. CT head scans can determine the inflammation and other changes in paranasal sinuses. Also it is widely used to conduct radiation therapies for brain and other tissue level cancers. CT head scan usually takes upto 45 minutes based on the number of images required for diagnosis. It doesn’t cause pain, but there might be some sort of discomfort while the contrast material is injected. There might be some kind of itching sensation which is very rare and can be cured quickly through medication. CT spine scans are more detailed than traditional x-rays where it can obtain images of different types of tissues in bone, muscle and blood vessels. Most commonly CT spine scans are used before and after surgery to diagnose the spinal damage and various types of tumours occurring in each vertebra. Also CT spine scan is helpful in diagnosing the degenerative diseases such as arthritis and common spinal problems like herniated disc which is a kind of problem with a rubbery disc between spinal bones. It is usually done with patient lying backside where technologists analyse whether the position is correct or not and use pillows for proper posture. 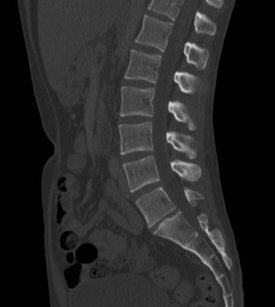 For lower spine scans, the contrast materials are usually injected into the spinal canal to detect tumours and to accurately locate the inflammation. In traditional X-rays, the images of internal organs usually overlap. 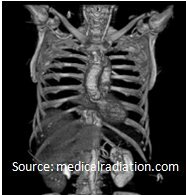 For example, if you want to diagnose the lungs/heart through X-rays, ribs will usually overlap on such organs making it quite difficult to capture images. But, in CT Scans the internal organs are more clearly captured by eliminating the other overlapping structures. These advanced CT scan images help radiologists to accurately diagnose the shape and density of the internal structures. CT scan is always painless unless you are allergic to contrast materials. Chance of Cancers: Most common risk as many researchers and physicians convey to the world is that the radiation in a CT scan is quite dangerous, increasing the chance of getting cancer. Such false statements are creating confusions on the minds of people undergoing CT Scans. According to research, CT scans have not created any long-term effects. Also, the newly upgraded CT machines produce very less radiation and generate clearly sliced images than older CT scanners. Pregnant Women: Only for pregnant women, usually CT scans are not recommended unless there is an emergency. If the CT is used only for chest or head there is no risk for the baby. But, if you undergoa CT scan for abdomen and pelvis, there may be a mild risk for baby and a chance of developing cancer on unborn baby. Continuous exposure: As a common rule in radiology – the higher radiation, the greater risk. If you are using CT scans for long-term basis, there might be a chance of getting cancer and other radiation related diseases. Also children have chances of getting risks than adults and very rarely their DNA’s might get damaged due to the x-ray radiations. Contrast Material: Before taking/injecting the contrast material for high resolution imaging, a patient who is undergoing a CT scan will be having a short medical test or study of your previous health records to check whether they have any medications for some other health ailments. The contrast material, usually iodine based can cause some allergic reaction to patients only those have some other health issues which will be pre-diagnosed through medical tests. Otherwise, there will be minor reactions such as nausea and vomiting rarely. Hence, nothing to worry on contrast material intake for CT scans. 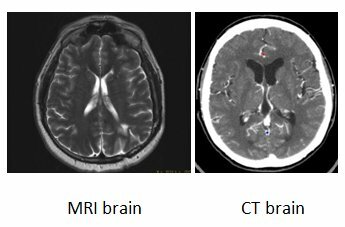 High CT scan Radiation is harmful? The radiation doses used in CT scans are usually measured by Millisievert (mSv). According to research, a common man is usually exposed to a radiation dose of about 3-4 mSv per year from nature’s radioactive material and cosmic radiations from space. Below chart from radiologyinfo.org will give you a detailed overview about CT scan radiation doses for various organs in our body. Radiations emitted by CT scans are quite lesser than a passenger travelling hours of flight journey. CT scans usually have very small potential risk. More likely it was less than 0.5 percent on getting a future cancer. The sensitiveness of organs on CT scan radiation varies for each organ. Breast, thyroid, lungs and bone marrow are more sensitive than brain because of its reduced cell divisions. Radiation safety experts usually suggest physicians on limitation of radiation dosages based on the patient’s diagnosis requirement. Hence there is no need to be afraid of the risks unless when you are undergoing frequent CT scans. Also inform your physician if you have any history of heart problems, asthma, diabetes, thyroid or kidney problems. Before taking the contrast material, you will be signing a consent form which gives you the detailed risks and side effects associated with it. Read out and confirm with radiologists whether you will be allergic to the contrast material. If you are pregnant, you should avoid CT scan and also you have to inform the physician. If you are undergoing scan other than abdomen, there will be no problem. But usually X-ray radiations from CT scan are always harmful to pregnant women. If you take contrast material, then after the scan procedure, you have to take more fluids continuously to flush such contrast dye. Once your scan is done, you will be monitored for some time whether you are affected with any side effects of contrast material. If you feel any pain, reddishness or swelling in the IV injected area, inform the specialist immediately. 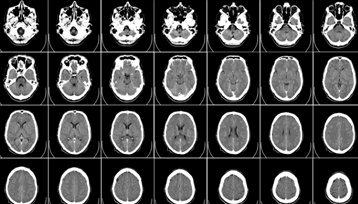 There is no specific precautions after CT scan, but sometimes your doctor may advise for specific diet and activities based on your health condition. CT scan or MRI which is best..? Yes, many of us have a question what is the difference between CT scan and MRI scan and thinking about which one is better than other. Usually both CT and MRI scanner machines look similar but what it does is entirely different. CT scanners emit X-rays into the body and produces images of density and the tissues of a solid organ and can provide detailed information on head, eyes, inner ear, sinuses, chest, pelvis, hips, reproductive systems, bladder, gastrointestinal tract and skeletal system whereas MRI scanners emits powerful magnetic radio waves to produce pictures of organs, soft tissues, bone and other internal body structures. Based on the patient’s health condition and the kind of diagnosis required MRI and CT scans both are equally best in their strengths. MRI scans test results are more specific than CT scan. The quality of a CT scanner is usually defined by its number of ‘Slices’. Higher the number of Slices, the more accuracy in detailed imaging. 3D CT Scanners replaces the 10 year old 2d CT scanner where it is commonly available in most of the CT scan centres in Bangalore. The CT Scans are usually popular because of its imaging speed and patient friendliness. For most of the emergency treatments like for accident cases, CT scans are usually preferred as it can diagnose quicker and the imaging is more accurate to begin the treatments. Some of the Leading manufacturers in CT scanners market are Siemens, GE, Philips, Toshiba, Hitachi Medical. Most of the CT scanners used by Bangalore labs/Diagnostic centres are between 8 to 64 slices and few centers use 128 to 256 slices CT scanners. 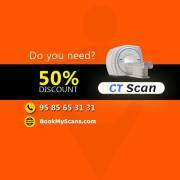 320 to 640 slice scanners are also available in some of the CT scan centers in Bangalore. 4D CT technology already became popular in western nations. Below is a 4D CTA DSA (Computer Tomography Angiography vs Digital Subtraction Angiography) imaging of brain perfusion from Toshiba Scanners. As we mentioned earlier, radiations emitted by CT scanners are usually measured in Millisievert (mSv). 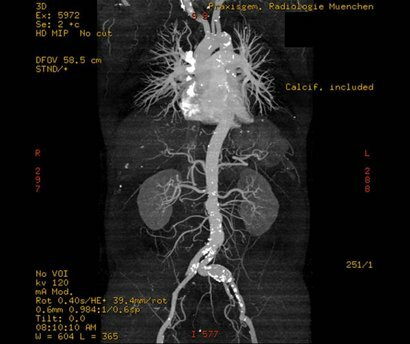 Modern CT Scanners provide very detailed images of blood vessels and internal organs by using very low radiation doses. Below image is a sample CT scan of the abdomen and thorax where the image is captured within a second and only 20 ml contrast material was given to the patient and the radiation dose is just 2.32 mSv. Atomic Energy Regulatory Board (AERB) of India audits and recognize the diagnostic scan centres in Bangalore. According to Atomic Energy (Radiation Protection) rules, 2004 they won’t charge any registration fees for diagnostic centres and their ultimate aim is to protect patients from high radiation emitted by the diagnostic equipment. CT Scan centres in Bangalore should provide AERB on the specifications of their machines, evidence of quality assurance and they should have requisite license and registration from AERB. Also, the regulatory board also does periodic audits and sudden inspections on such scan centres to determine their quality. They also sealed some of the scan centres who are not abiding the regulations. 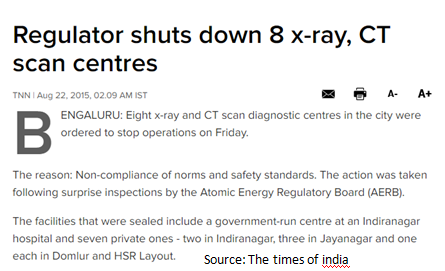 Here is the news snapshot from Times of India article where the authorities have sealed down 8 X-rays & CT scan centres in Bangalore including a government run centre. To avoid legal complications, CT scans centres in Bangalore are usually renewing their diagnostic lab license year on year, which will ensure the periodic stability and quality of their CT scan machines. Bangalore has the best health care facilities as compared to the other parts of India, but experts says that the number of diagnostic centres in are still not enough due to the increased lifestyle diseases and with the number of patients growing year by year. How to Compare CT Scans pricing & Book appointments online? 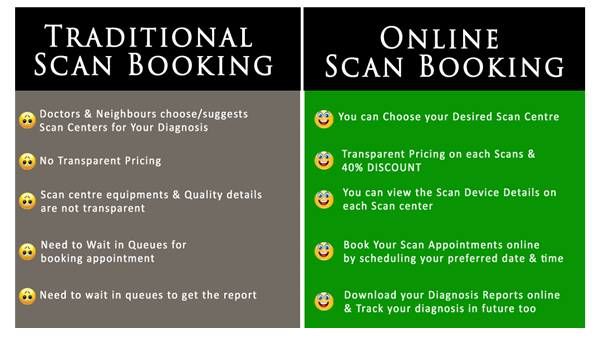 Online diagnosis scan portals like www.bookmyscans.com can help you in this situation where comparing scans is easier than ever. Bookmyscans.com is specifically designed to compare and book scans online. It functions like other popular aggregator websites such as Redbus.in, Bookmyshow.com, Makemytrip.com and letting you to decide on choosing the best CT scan centres in bangalore. Hence, comparing the scan centres based on their quality and price through online scan booking portals can give you the solution in your finding towards best ct scan centre. 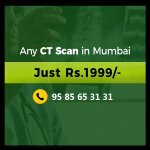 Other than bookmyscans.com, there are few other diagnostic scan booking portals which you can find while surfing in Google for CT scan prices in Bangalore, there might be a huge difference due to the outdated price structure and the live offers of diagnostic centres which are not updated in regular. But bookmyscans.com operates dedicatedly as a connecting portal to serve the needs of CT scan booking customers and helps them to choose high quality CT scan centres as per their diagnostic needs. You can schedule your date and time of appointment and pay offline in the scan center by card/cash. Hoping that you got a clear idea on what is CT scan and A-Z about CT scan centres in Bangalore. In our digital generation, we have the greatest option to enjoy the best quality of services at lesser costs by fixing the scan appointments online. 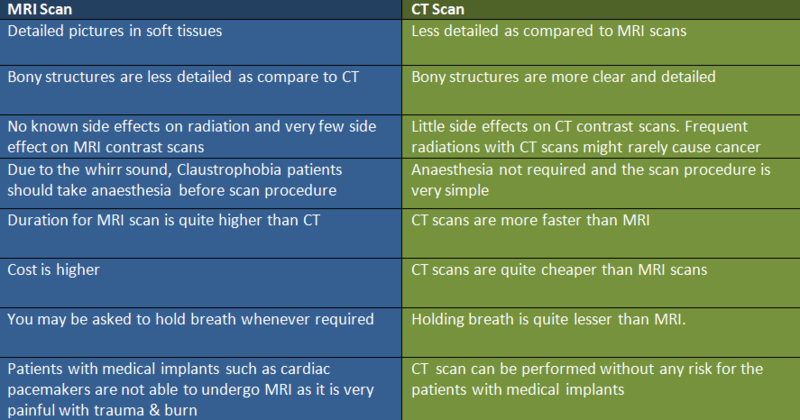 Compare your scans: It’s true that you can’t get a clear price structure for your scans in traditional scan booking, but when you opt online then you can compare the scan prices of various ct scan centres in Bangalore. Low Scan Pricing: Another important advantage on booking scans online are that the price of scans are as low upto 40% when you compare with traditional scan booking. You can also get several discount and offers and save your money in huge margin. Save your time: Instead of spending hours of waiting in the scan centres, you can book the same scan in the same centre through online within 60 seconds and fix your desired date/time. Once you have fixed the scan appointment you can pay the scan bills online. Quality of Scans: If you are doing the traditional scan booking, then you can view the scan machines only when you are lying on the scanner table during your appointment. During the online scan booking option, you can see the quality of CT scan machines in best scan centres of Bangalore. Even you can see the reviews of people who used the scan centres. Online Reports: As you know, due to the increased patient population, waiting in the scan centres for reports is time sucking for everyone. You have to spare a whole day or you have to rely on someone else to collect such reports. But in online scan booking, you can eliminate all such hurdles and download the scan reports which also help you to keep a track on your health if you are doing regular diagnosis.